The ideal 14-foot Deep-V Outboard. 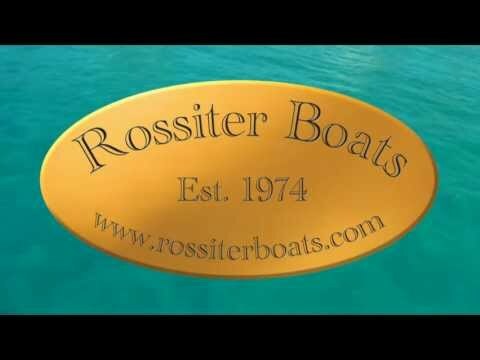 This is a craft with all the tradition and innovation of Rossiter Boats – coupled with exceptional fuel efficiency, ride and performance that are second to none! 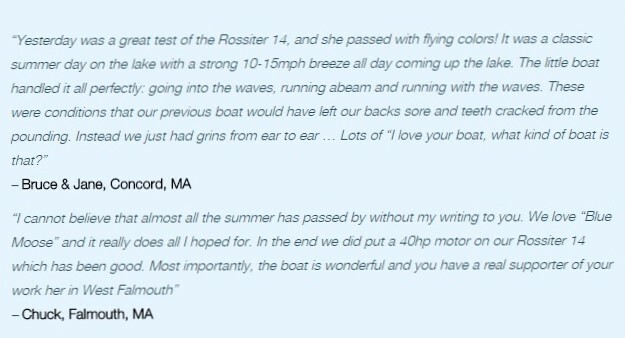 It’s just 14 feet from stem to stern, but performs as if it was far, far bigger, having many features you would expect on much larger boats.The Rossiter 14 was designed to thrive in big water, with exceptional stability and safety, as well as a remarkably smooth, dry ride even when the whitecaps rule. Unlike other boats of similar size, the Rossiter 14 is rated by the Coast Guard for five adults and 50 horses (we recommend 40hp) – so if you want to get up on plane with the whole family on board, or pull a young water skier or two kids in a tube, you’ve found the perfect boat to do it. 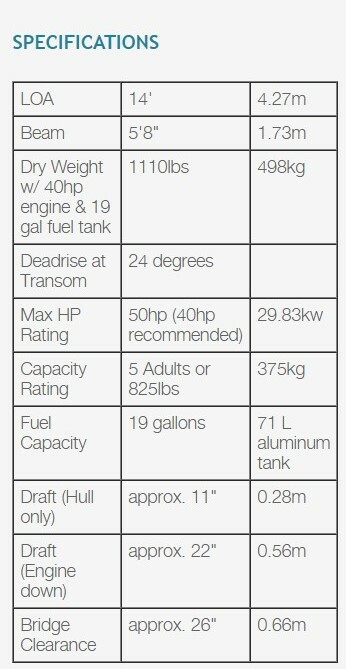 With respect to construction of a Rossiter power boat, our hull design is unique to Rossiter with a focus on big-water performance, efficiency and ride, not to mention our commitment to quality fit and finish. Our boats have hand laid, solid hulls with a molded, foam-filled stringer grid, and the use of structural closed-cell foam cores used where needed to provide the necessary panel stiffness in our liners, decks and transoms. They also have a vinyl ester barrier coat to reduce the chance of osmotic blistering and print-through occurring. And, in fact, the only wood in our boats is the teak accents you see in the interior cockpit area. You should also know that our liners are bonded to the stringer grid, topsides and transom, independent of the deck assembly which is bolted to the sheer using machine screws every 6″ though a 1/4″ high density epoxy board which runs the length of the sheer. This method provides you with a very solid feel to the boat, thus enhancing the ride delivered by our hull shape and many years of enjoyment.